Batagor is the shortened from BAkso TAhu GOReng, or in English language mean fried meatball and tofu. But, it's not only fried tofu and meatball. Sometimes you can add boiled/ steamed egg, cabbage and dumplings which in here it call siomay. The dumpling it self can be steamed or just fry it. And of course a steamed potato. Sometimes you can add bitter gourd, but since it bitter, I skip that one. 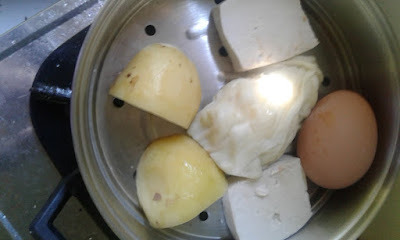 I just steam all, the tofu, egg, cabbage and potato without boiled it first. The taste? Well it crunchier, especially the cabbage. 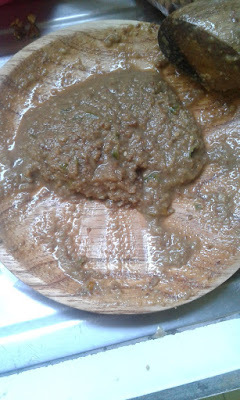 What I really like from this food is the peanut sauce. It different from satay peanut sauce. 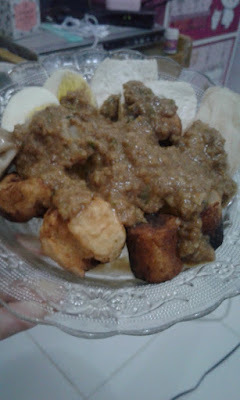 So, I search at the internet how to make batagor's peanut sauce. And FOUND IT!!! 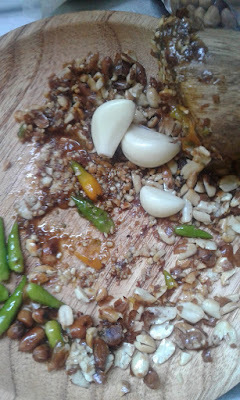 Chili; depend on how spicy you want it, for save just use not more than 5 chilies. Palm sugar; just a bit of it, you don't want your sauce to be too sweet right. All you have to do just crush it all until soft. Since I don't have a blender (it can be an alternative too, if you too tired doing a traditional crush), so I use a pestle & mortar. Pour the water after all a little bit soft, but not put the lie leaf and lime juice yet. You will doing it latter. OH NO! I FORGET TO ADD GARLIC!!!!! Aaaannnddd... there is the result of the peanut sauce. After all looks like that, you put it into the pan, and boil it until boiling. But remember to boild it with a small fire. 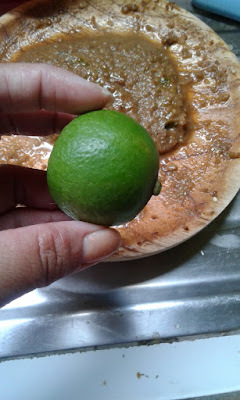 In this stage, you can add the lime juice and lime leaf. Just cut the lime leaf into a tiny pieces. But don't forget to get rid away the center of the leaf. 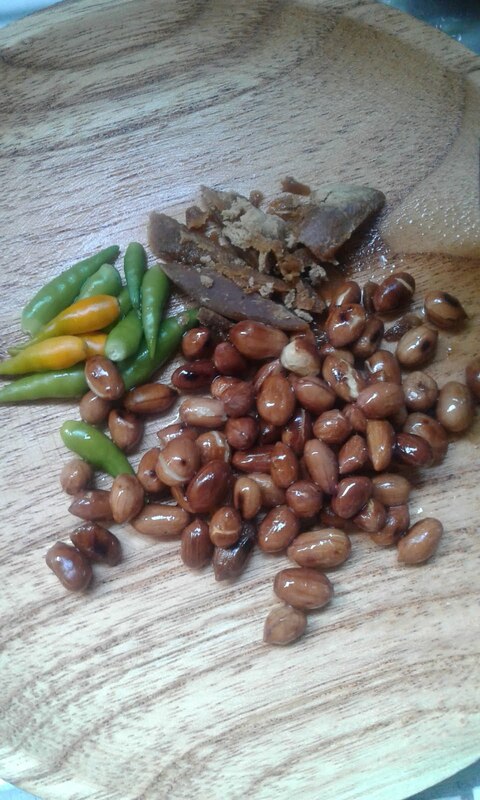 Put it into the boiling sauce together with the lime juice. What kind of lime? So here the food that finished being steam. 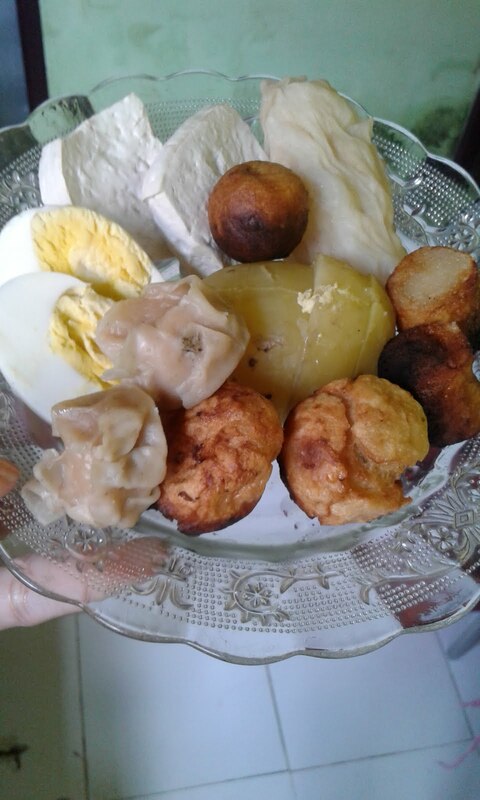 I add more fried batagor, and the dumpling I add at the steamer when I realize I forget to put it (again, nobody perfect :p ).Now it ready to add the sauce..